Drums can simultaneously be one of the most fun and frustrating elements of a mix. Drums take up the most dynamic space in the record, and at the same time are usually desirable as the loudest element in the record — which is a bit challenging when you want everything else to not sound completely dwarfed. They’re also an element that demands to sound natural (in many instances), but also unique. Paradoxical … yes. Fun … also yes. For me a big part of resolving these contradictory ideas is parallel processing. 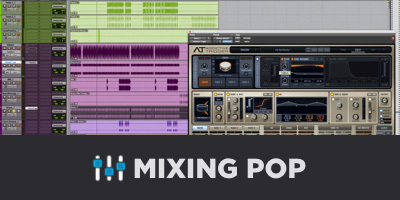 Quick recap: parallel processing is when unprocessed and processed versions of a track are blended together. The major benefit to this approach is that you can be utterly bat-nuggets crazy on your processed track, and then simply blend in enough of it to accomplish what you’re trying to do and leave the rest of the sound up to the dry version. Parallel compression is by no stretch a new thing. But in case it’s a new term: the idea is your parallel track goes face first into a compressor and gets shmooshed to gravy, and then blended up into the uncompressed track. Primarily, this enhances the sustain of the drums without really altering the attack — a technique which is tried and true for both close mics like snare and kick, and also for the whole of the kit. The added bonus is that if you time the release right, you can create a little push-pull motion for the drums and enhance the sense of groove while you’re at it. And you get some of the character of the compressor as well! Distortion can be a great tool for imparting character, aggression, and making things more impactful. The only problem with distortion is that it makes things sound … well … distorted. Now, it’s certainly not uncommon for me to use distortion on drums with the key to it being very subtle and nuanced with my settings. But sometimes I want something more assertive: heavy distortion in subtle proportion. Enter parallel processing. In this set-up, I can basically run the drums through the trashiest thrashiest distortion on the planet, and simply blend in what I want. The textural possibilities are somewhat endless. This is just one of those spots where I get to have fun and be creative. It’s pretty rare (if ever) that I create a mult to EQ the return and blend it back in with dry drums. However, it’s pretty common that I’ll use EQ in conjunction with compression or distortion on a parallel return. The big one is compression, specifically on kick or snare. One of my favorite techniques for getting low end into both kick and snare is to throw on a low-shelf on the parallel return and jam it all the way right — and then compress the sugar out of it. Important to note: the kick corner frequency is going to be somewhere between 40 Hz and 80 Hz, while the snare corner will usually be between 100 Hz and 150 Hz. This should be obvious, since the low end of each element is centered in a different frequency band. And these aren’t hard and fast numbers, just depends on the specific element. A variation on this with snare drum is gating the return so that you eliminate the sustain of the snare, and use an EQ to brighten it. Effectively this gives you a brighter attack sounds, without bringing out the snare bands. This one is weird and pretty specific to a very nuanced situation. Sometimes I’ll get a drum recording that is simply too well recorded. Odd thing to say. But in general, we are in an age where we default to “get the best recording possible, we can always dirty it up later.” And as far as a default goes, I think this mentality is fine. Ideally we get what we want on the way in, but sometimes the direction isn’t there. For just a short crash course: WOW refers to drift in the low end and we hear it as pitch modulation, Flutter is a faster drift that we hear as harmonic scrambling (makes the tones harsh and rough). For these purposes, while flutter can be cool, I am really focusing on the WOW. I will turn that WOW setting up so that the modulation is audible and disorienting, and then use a wet/dry knob to tuck it in so it simply sounds like it was recorded to an old tape deck. This causes the effect of simultaneously thickening and thinning the sound while rounding out the transients, and can be great for a certain Indie kind of feel. These are just a few of the parallel techniques that come to mind. The fun of parallel processing is that you can be really extreme and simply moderate your return — so let your imagination roam free and try different things! Sky is the limit.